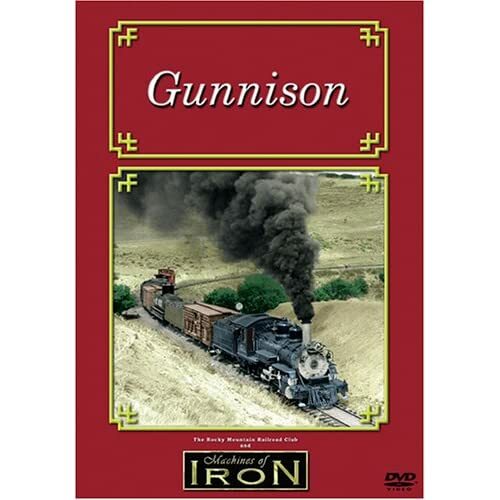 Culled from the footage of the Rocky Mountain Railroad Club, this DVD explores the Denver & Rio Grande Western (D&RGW) narrow gauge lines around Gunnison, Colorado. Locations: Gunnison, Ohio Creek, Crested Butte, Marshall Pass, Sapinero, Black Canyon of the Gunnison and Cerro Summit. What makes this DVD special: Rare footage, especially of a flanger car in action as it plows the tracks clear of snow. Otto Perry and Irv August both made trips to the Gunnison area in the 1940s and 50s to capture the narrow gauge action in and around this mountain town. Their efforts give us a glimpse into the final decade of operations over the Marshall Pass route, the original narrow gauge mainline of the D&RG to Utah. When the standard gauge route over Tennessee Pass was completed, the Marshall Pass line became a backwater with steam engines hauling livestock specials and the odd shipment between Montrose and Salida. A few fall aspens and gorgeous vistas form the backdrop for D&RGW 268 in Bumblebee livery (now on display in that livery in Gunnison) and her sister engine 278 (preserved at Cimarron) both make several appearances as do the Mikado-style engines that serve as the engines for today's Cumbres & Toltec and Durango & Silverton lines. So much history comes alive on this DVD. Several locations shown are now beneath the waters held by dams on the Gunnison River west of Gunnison. Livestock extras and a flanger plow in action viewed from the caboose also separate this DVD from the pack. This film is a must for any serious narrow gauge modeler as well as the average enthusiast looking for an alternative to the ho-hum, standard-gauge fare. A worthy addition to your collection.